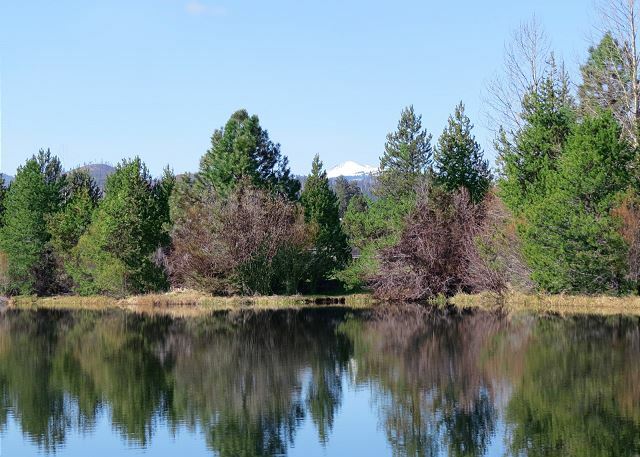 Enjoy all the ambiance Black Butte Ranch has to offer when you rent this stunning lake front condo! Relax in its remodeled and upgraded interior, which is a spacious 1,388 square feet. Transport to your own private mountain paradise with the unobstructed mountain, lake and meadow panorama from the large picture windows. Step onto the decks to enjoy the view and fresh mountain air or that evening BBQ with friends and family. There is never a lack of amazing views of wildlife, fishermen, cows and horses grazing and guests canoeing and kayaking. As you enter this condo, there is a Queen bedroom off the entry, with a 3/4 bathroom (plus stackable washer and dryer) in the hallway. The entry opens into a dining area on one side and kitchen on the other. The kitchen is light and bright and updated and you can enjoy the views as you prepare meals. The views are also amazing from the comfortable living area. Upstairs is the Master bedroom with a brand new King bed and a small reading area with views galore.There is a back bedroom with a Queen and twin and trundle. A full bathroom is shared by both bedrooms. The condo also offers air conditioning and wireless internet. Plus, it is just a short walk to the new Lakeside Recreation Area with its pool, hot tub, recreation center, exercise room and bistro. This may be the perfect vacation spot for the kids or a private get-away! PLEASE NOTE! DURING JULY AND AUGUST there is a 7 night minimum on most properties plus a specific turn day, i.e. Saturday for most condos. if you wish to deviate from the schedule or are having difficulty booking on-line, please contact Howells Property Management, 888 762 7763 x 2 for assistance. Black Butte Ranch is special. There's nothing like it with the mountains surrounding you and the gorgeous Ponderosa. The home was perfect for our stay, two couples, longtime friends who love to play golf together. Happy to hear you enjoyed your stay at BBR! Thank you for booking through Howells. We had another happy family reunion at Black Butte. We stay in two adjacent condos. Children enjoy biking, swimming, the rec center as well as family activities. The setting is spectacular. Aside from a burned out bulb in the kitchen, all was in good order - clean and well supplied. this was our first visit to the condo's at black butte - we had a very nice stay - the condo was comfortable and the view was spectacular! Black Butte is magical in the winter! I loved the location and view, as well as the proximity to lodge, etc...The snow made this weekend extra special. Having firewood right outside the door was fantastic.